It is the end of the season for these Queen Anne's Lace. Each quite different from the other. Mary MacADNski: I enjoy Monday's B/W for the reason of the great differences one can see. These both have a very nice abstract quality, Mary! What a lovely song! So good solo acoustic! Mary MacADNski: I would love to see Al Green live. Any of his live music is so great as he really reacts with the audience. I like this acoustic Al a lot too. 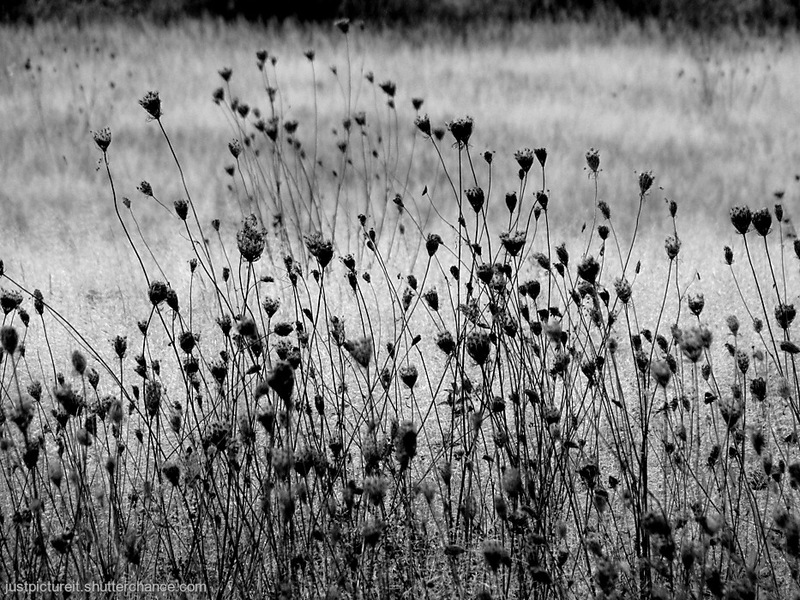 The b/w has a real abstract quality for sure! B/w is appealing....But I think I like Queen Anne in colour Mary, nice. Mary MacADNski: Colour wins here most often, Frank. Mary MacADNski: Just pretty little baskets of seeds which will be released under the snow. I've seen these before but not aware of their name. The B&W version has more of an abstract feel to it . Mary MacADNski: I agree completely about the b/w. The white flower heads of these can be the size of a saucer but their seeds turn to an upturned umbrella shape. This one is definitely better in black and white. Mary MacADNski: I agree but love the drop of purple clover in the colour which no one else seemed to notice. Mary MacADNski: You're with Frank and prob others. Two monochromes! Both work well. Mary MacADNski: That's kind of so. Queen Anne's Lace is one of my favourite wildflowers, Mary. Two lovely shots of them. Mary MacADNski: One of mine too! I use them in outdoor bouquets every year. They are free in ditches but full of pollen so I always combine them with daylilies in outdoor vases. I like both versions equally as much. Mary MacADNski: They both have their qualities. What a nice name for these grasses - I recently watched the film "The Favourite" about Queen Anne. Mary MacADNski: I do not know that film but will watch for it on Netflix. Mary MacADNski: You are in the winning group. Mary MacADNski: I am with you there, peter.